The 4th ISCAR Summer University “Moving with and beyond Vygotsky: Developing cultural-historical methodology” began with a traditional welcome address from the rector, Vitaly Rubtsov, who wished everyone good productive work and shared his joy that the tradition continues. Dr. Martijn van Schaik gave a brief speech on behalf of ISCAR with a greeting from the president of ISCAR and encouraged the participants to consider ISCAR membership. The opening lecture “Cultural-historical theory and its suburbs” was given by Prof. Vladimir Zinchenko; the faces and the histories of all great scholars of the past were before our eyes and are now in our minds. 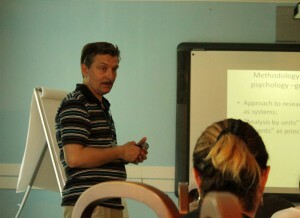 The day continued with a lecture “The concept of joint activity as a unit of activity theory. Joint-distributed learning activity” by Prof. Vitaly Rubtsov; we have learned about the fundamentals of cultural historical psychology, got a glimpse of experimental research on development of joint actions, and realized that it calls for much more than one lecture. After celebrating the good beginning with a glass of champagne we travelled to Povedniki to enjoy good weather and good company, fresh air and fresh outlooks on our research! By casting concerns into creativity and problem of modern school, Pentti take notions from Activity Theory approach, such as Vygotsky, Davydov, Elkonin and Zukerman, to reflect traditional linear-way of doing experiment. Through these lens, he proposes teachers’ work nowadays should focus on social relation among students instead of individual student separately. Accordingly, He tries to overcome traditional causal logic to do experiment by using the notion of “genetic experiment” and emphasizing the importance of activity of children’s theoretical think. In other words, he argues teacher should include students’ initiatives, therefore creativity from students and expanding of students’ theoretical thinking from individual to a group are possible. However, some problems are remaining for further discussion. They could be grasped as the following. 1. How does teacher discern/know the critical point of student learning? put alternatively, when student is “mature”? 2. How to justify the importance of “play activity” in “modern” world? Could this justification be generalized to the world beyond Finland? These questions may require historical analysis of activity. 3. Follow the upper question, there are actually some successful cases about play activity in somewhere already. These diverse experiences may work as “prototype” for further expanding and institutionalization. The focus of the lecture was to relate science and practice. In order to develop this idea, traditions on research were recapitulated through Hegel-Marxism; the concept of praxis as collective reproduction and transformation of conditions. In this pathway an important issue raised was, how we can relate practice to activity? Are they intertwined? Are they different? Is practice related to the three level established? In his presentation, Przemyslaw started from the challenge in the case about foster care, and presents the effort on solving it by focusing on activity of family and strategies developed from that. The goal is to restore the relations between parent of children. According to the result of implementation and problem emerged after that, he also also suggest some strategies, such as including more participants and moving meeting site from institution to family. The research shows the potential to contribute at least two aspects. Practically, on the one hand, family concept is kind of serious challenge in the world while neo-liberalism is flooding and striking with traditional social structure. In short, it is not a problem only in Poland, but also in other countries; on the other hand, the research takes the issue about emotion, such as belongings. That may contribute to concept of “perejivanie” from Vygotsky. 1. How to use activity as a unit? 2. Why the research took those strategies? In terms of Beata’s presentation the following discussion picked up on the different approaches to arranging doctoral training, the connection between the goals of the university for the training and the personals goals of the students, and whether documentary methods would foster students insights on the community process. In addition, the question of sharing authorship with the students on writing about the community process to academic journals being a possible way to credit their participation, was suggested. The presentation dealt with wooden boat building and the main objective is to discuss the role of the subject in the activity. In order to base the discussion Leontiev and Rubinstein were introduced as authors from different contexts who discuss similar issues, the subject for example. Another point brought about was the difference between the object of the world and the object of activity in relation to history. Martijn van Schaik: Let the video be your guide A case study of a video-based design research. Martijn’s lecture on his phd work and video methodology was divided into two section. In the first section he focussed on the actual practice of doing video based analysis and data handling in connection to the theoretical conceptions of his work. In the end of the section he shared some of the questions he is currently ensuing in his analysis. In the following discussion some new proposal emerged: it was suggested that a possible avenue would be to look at how the three different ways of objectifications of the students’ theoretical thinking related to each other, or how different theories are articulated when there’s are disagreements among the students. In addition, one suggestion was that one could look at mimicry of the master as possible way forward, or getting the students to create a 5 minute educational video on designing a tricycle. Also Martijn’s idea about looking at embodied cognition was seen as a valuable avenue. The second section of the lecture focussed shortly on some of the differences between design based research and CHAT. One main aspect of the ensuing discussion focussed on the question of who initiates the interventions and to what extent different parties have possibilities to direct the research process. These questions related directly with Pentti’s opening lecture and his points on the non-linearity on the research process. The concepts of prototype, relevance and also understanding what you as a researcher bring with you to the negotiations are important. The morning started with a lecture on “Cultural-historical psychology as non-classical science” presented by Professor Dmitry Lubovsky from MSUPE. One of the topics covered was the methodology of cultural-historical psychology of L.S. Vygotsky based on Yudin’s ideas (1976), developing the following four levels: philosophical, general science, concrete psychology and procedures and techniques of research. The current levels can be a useful reflective tool for developing our own research models and structures. 1. Zinchenko V. P. Thought and Word: The Approaches of L. S. Vygotsky and G. G. Shpet // The Cambridge Companion To Vygotsky. The Cambridge University Press, 2007. 2. Zinchenko V. (and Wertsch J. V.) Shpet’s Infl uence on Psychology // Gustav Shpet’s to Philosophy and Cultural Theory. West Lafayette, Indiana: Purdue University Press, 2009. 3. Zinchenko V. P. Lev Vygotsky: From “Silver Age” to “Red Terror” // Children in Europe. Exploring issues, celebrating diversity. Vygotsky issues. 2007. Further discussion on the research problems continued with Dmitry’s comments to students’ research and group discussion with professors. 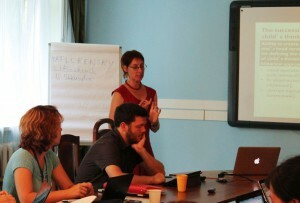 After lunch Professor Milda Bredikyte presented a lecture “Play as a meeting space of thinking and speech”. 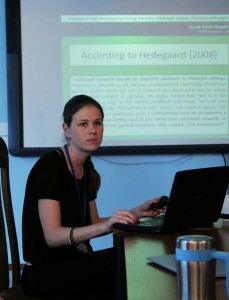 The main point of Milda’s presentation was the analysis of play with the use of the terms of ZPD perezhivanie [en. experiencing, rus. 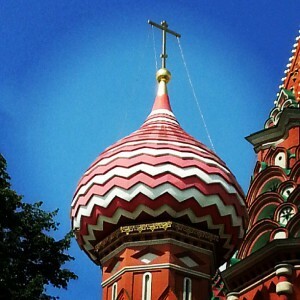 переживание], using video footage. Her understanding of perezhivanie comes from cultural-historical psychology. For more information check Vasiluk “The psychology of experiencing” (1984, Rus; 1991, Eng) and his definition of perezhivanie as an activity of overcoming a crisis situation. The day concluded with two presentations of PhD students: Nina Putra-Ukkola introduced her research project, “Elements of Personality Development in Play Word”. Building on the playworld of “Alice and Wonderland”, she tried to find answers concerning the creation of a genetic experiment which develops imagination and creativity. Finally, Giselle Modé Magalhães presented her project, “Analysis of Child Development during the early childhood: activity of actions with objects”, stating a problem of validity of Elkonin’s characterization of the stages of child development half a century after his works. Shai’s photo, made by Natalya U. In her lecture Prof. Eriksson outlined the current problems of the collaboration between researchers and teachers and showed that their joined effort can be beneficial to both. In order to share the power of research with teachers researchers need to have tools while teachers need to possess a certain level of agency to take an active part in research programs and discussions. Mutual work of researchers and teachers in planning teaching activity can be evaluated according to five criteria: object (teachers’ or students’ learning), definition of a problem (whether researchers or teachers formulate the problem), solution (researchers’ and teachers’ contribution to the solution), theoretical tools, and division of labour. The main goal of researchers’ and teachers’ collaboration is to help the latter to increase their level of agency and become collaborative researchers. Prof.Eriksson pointed out that her lecture was aimed at raising more issues rather than giving answers and indeed the lecture stirred up a lively discussion on didactic approaches and collaboration between teachers and researchers. In his presentation the researcher proposed a new approach to the process of negotiation between different levels of educational system of Taiwan to overcome bureaucracy and enable each part contribute to policy making. The questions arisen by the speaker included the role of play and imagination in policy making and juxtaposition of problem solving and competition in policy making. The presentation touched upon the problem of adult-child sharing of their emotional experiences and a child’s role as a co-researcher. A special focus is placed on the agentic aspect of child’s participation in the research. Through depicting and capturing the moments of intense joy a child promotes a dialogue with an adult and learns to reflect on their own experiences. The speaker evoked the following questions: (1) In what way the data-set of his research may be used and (2) How CHAT concepts can be applied. The speaker presented the results of his experimental research involving himself as a mediator and children of different age-groups whose task was to acquire the idea of timeline in history. The speaker posed the following questions: What are the mediating properties of the timeline in an experimental setting? and In what way (de)construction of time can benefit children’s understanding of history? The researcher’s main concerns are (1) finding categories for analysis of textbooks instructing teachers of mathematics and (2) understanding the nature of generalization process in children’s acquisition of maths concepts. The speaker highlighted several perspectives in which the process of generalization may be interpreted and suggested that generalization needs a crisis and the way out may lay in solving maths problems. In this presentation the speaker gave an overview of the structure of the system of education in Brazil. She pointed out the problem of working out a management plan in collaboration between all levels of the system. The speaker suggested “voice” as a descriptive and explanatory concept and discriminated three types of its manifestation: monovoicedness, univoicedness and multivoicedness. The last type may become a valuable tool in the negotiation process between levels of the educational system. The speaker reflected on the existing approaches to the school reform in Austria and suggested his own view of the problems which arose in the process of changing the school system. He suggested that CHAT can be applied to meet basic psychological needs of the teachers in rural and urban areas who are struggling to fit into the system. The speaker presented a model of their needs and activities educing as units of analysis the following components: disturbances, innovation and contradictions in the activity system; multivoicedness of discourse; transition in the overall pattern of object-oriented interaction in a given activity system. The speaker tried to answer the following questions: how self-identity develops, what can be done to promote its development and how a student can become flexible moving between different self-positions. The components of drama in education, highlighted by the speaker were as follows: role, context, theme/focus/learning area. Moreover she put special emphasis on reflecting on drama therefore leading to the problem of teachers’ role in this process, unit of analysis and submerging children into the state of flow. The speaker presented an educational complex as integration of activity system of different institutions in which all voices of practitioners should be taken in consideration. In the setting of Change Laboratory teachers and researchers are suggested to collaborate and work out a common activity system. A common object of activity is presented as a basis of projecting new complex. 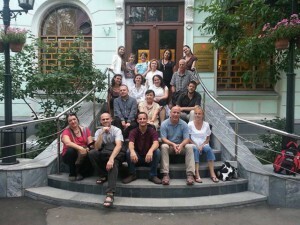 The following guidelines for discussion were suggested: Ideas of CHAT relevant to understanding reform in different context; the role of CHAT and historical dimension in research of educational reform; developmental character of cultural-historical methodology and methods applied to research of educational research process. Brief group discussions resulted in the conclusions which may be summed up in the following way: (1) one should apply CHAT principles with regard to the local specific features; (2) have in mind the concept of chronotope, which comprises the spatio-temporal matrix and governs the base condition of all narratives; (3) find real connections between CHAT and policies of the institutions. Prof. Irina Ulanovskaya gave a lecture “Comparative analysis of development diagnostics results of students in traditional school and in the system of developmental education”. During the lecture, the professor pointed out that the concept of “goals” is crucially important in schools development. She focused on the questions: How to elaborate the tools of the schools’ description? What is the “perfect” school for the child from parents’ perspective? How to choose a school for a child? Prof. Irina Ulanovskaya presented the classification of schools based on the everyday practice: “luggage storage” (not student-oriented activity), “moving to be successful in evaluation” and real developmental education approach. Monica asked a question about overlapping the two dimensions: needs demands from policy level vs. real school need. Game was organized in two parallel group works with 4 participants in each group. Other students made observations. 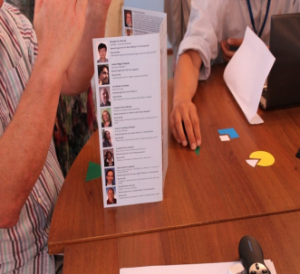 Each participant received set of geometric figures in different colors. They had to work together to construct four geometric figures, but they were not permitted to see the other participants’ pieces. Students discovered the following: tools and sign of measurement to solve the task: Paula started to use the fingers, Martin – measure paper clip; Honda used a sign, image of “Pacmen”. But the students did not have the opportunity to use the drawing as a tool; they did not “see” the paper and pens. The second group could not elaborate the tools to solve the task. Students became involved in real experimental situation and could work out the second stimulus in actions. • Shai Olsher presented his work “Changes in the textbook performed by teachers using a Wikibook”, and presented some questions: How to make the research well-founded using the existing data? Which directions should be explored when analyzing/using AT? How should I represent the analysis to best answer the research questions? • Zurab Mgeladze presented his work “The role of social interaction in the process of solving creative tasks by older preschool and early school aged children” and he asked some questions: Does the organized communication in the group affect the implementation of such creative initiative? Does it appear and in what form? Is it implemented only by members of the group who have previously shown such initiative by themselves or participants unfamiliar with such initiative start showing it as well? • Paula Cavada presented her research “From kindergarten to first year primary: children’s perspective on this transition and literacy development at the school setting” and she asked questions about how she could build the coherence between empirical categories and theory. • Lucilene Fonseca presented her work “Digital media & social activity: a way to reach critical collaboration in the teaching -learning of foreign languages”. She is now conducting data analysis, and she asked the group about it. The afternoon started with a lecture on “Adolescent crisis and its interpretation in the framework of the cultural-historical theory” from Olga Rubtsova. Her lecture began by introducing the historical evolution of approaches to understanding adolescence. Many pioneering researchers from different subjects were presented, including Franz Boas. Then she moved to second part- the contribution of the cultural-historical tradition in understanding adolescence. Crisis, as the principle mechanism of development, was proposed firstly by Vygotsky. And for development, some conception as biological factor and social factor are inappropriate. Instead, they will be resource of development. Then, she presented four types of new formation of adolescence: conceptual thinking; development of self-consciousness; development of reflexion;feeling of adulthood. Then she shared some ideas from her own Ph.D. Inner role conflict is a way to understand social situation of adolescence. According to Prof. Nikolai Veresov, there are some important principles for genetic experiments: buds, category (collision, conflict), real and ideal form, cultural tools of development, lasting effect. Finally, she gave us a good example of a warm up-task in a role-playing game. • Lyudmila Firsova presented “The problem of a model constructing in thinking process”. • Nathalya Zakharova presented her work “Self-concept of gifted university students as a basis for high achievements and self-actualisation”. She asked the following questions: What are the components of agency? What is the role of a university psychologist in gifted students’ adaptation process: a mentor, a partner? What is “successful adaptation”? The PhD students gave us feedback about their presentations in the summary of the day. Prof.Akhutina, a disciple of Alexander Luriya, gave a talk on the higher mental functions (HMF) in children and in what way neuropsychology can be of great help in facilitating development of these functions. The speaker pointed at extracerebral organization of HMF and the possibilities of remediation of these functions applying CHAT. According to the researcher, a human brain can react to the damage at different level, however the brain is plastic and complex enough to compensate for a missing function. In the process of compensation adult’s interactive support is crucial and may create optimal motivation which makes child more active and organized. Prof. Akhutina showed an example of a dyslexic girl of 8 years old, whose deficient writing skills were compensated through special training. The lecture included a summary of Activity Theory principles and the speaker reminded a definition of activity as a complex system which includes different levels. Prof. Solovieva talked about OBA (orientation basis of action)and its importance in children learning. proposed that a research in developmental neuro-psychology may become a well-grounded substitution of school reform. She highlighted that environment can’t be developmental unless it becomes a source of developmental education. In this way learning may be interpreted as a constant genetic experiment. Prof. Solovieva suggested that deficient writing and reading skills may be secondary to underdeveloped general perception. She gave examples of Mexican pre-school children whose ability to draw elaborate pictures was formed through special training. The speaker’s interest lies in the history of CHAT development and its ideological background. She presented a deep insight into the story of an expedition to Uzbekistan undertaken by A.Luriya. The speaker asks whether he followed the communist ideological line to praise the achievements of collectivism or this was his sincere conclusion that “the more literate person is – the more abstract the thought process”. The talk presented by A.Sidoroff-Dorso dealt with developmental synaesthesia. By drawing on research into environment-mediated and learning-based contingencies in perceptual activity as well as some ethnographic data, the presenter proposed a novel definition of synaesthesia. The researcher also reported some results of his own experiments testifying to the primarily cognitive instantiation of synaethesia. The talk was concluded with applications of CHAT in synaesthesia research alongside some methodological challenges that the phenomenon poses for the cultural paradigms in neurosciences. The main question of the speaker is how CHAT may be applied in case of creating inclusive program of education. She promotes an idea of “brain beyond the brain”, pointed at the inseparable nature of psyche and brain. The speaker warns that biologisation in inclusive education may be politically provoked and that teachers must collaborate with researchers in order to acquire the true understanding of the idea of inclusion.